In Part 1 of Keet’s Corner (here) we talked about how Keet mechanically affects the game and why we were so excited to bring him to the Red Dragon Inn. This week, we’re going to be diving head-first into all of the thematic design elements for this character. Welcome to Keet’s Corner Part 2: Look and Feel. The Card Titles: We try our best to have characters tell their own story. That’s why most of the card titles are quotes. We want players to know how their character talks and engages the rest of the party. Arguably, our most successful use of card titles is shown off with Gog, who doesn’t use many pronouns and yells a lot. Many newcomers sit down with us for a demo of RDI 2 and immediately start acting like Gog, shouting out their card titles and referring to themselves as “Gog” rather than “I” or “me”. This ends up drawing laughs from everyone at the table, and is just a great deal of fun. The artwork becomes even more important when we use a phrase or plain text for a card title. In these instances, we can still pull off a funny thing to say like Pooky’s “Nasty big pointy teeth” card. However, other times the title ends up being pretty vanilla, like Wrench’s “Noble sacrifice”. In these situations, we really need to push the visual gag, as we did for Pooky, or tell a lot of story, like how Wrench cowers while one of his gizmos acts heroically. The Effects: Occasionally we’ve used the effects box to inject some extra flavor into the game. Usually, we use the mechanics of the effect to continue the story from the picture or title. Other times, we explicitly provide a bit of italicized flavor text. We drop flavor text on many Drink Cards, as well as most of the “Everyone Pay Me” cards. But sometimes it pops up in other places, like Wizgille’s Gear Deck. 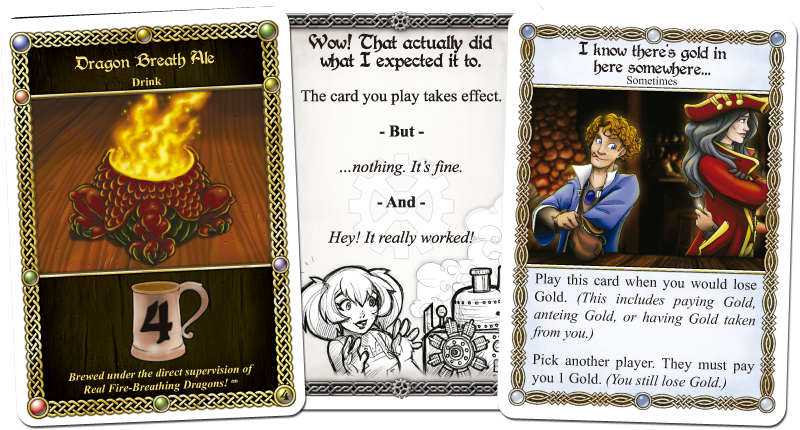 We are always striving to pair the mechanical effect of a card with its flavor – for instance, Joran’s “I know there’s Gold in here somewhere…” card is a perfect example of the effect playing off the visual and title. To really bring Keet to life, we needed to figure out how he talked. Was he curt and distracted or a little bit of an insulting sour puss? Talking with Ben and going over his card effects, we figured that Keet needed to be a fair bit excitable (he’s REALLY into his artifacts) but also a good deal sarcastic (being somewhat of a rogue). It also felt appropriate to sneak in a couple of references to his primary inspiration, Indiana Jones. It was extremely important to get a specific reaction out of players when they saw Keet for the first time. He needed to be a pulp-fiction archaeologist adventurer, reminiscent of Indiana Jones, and we worked with our artist Erin Wong to push him more and more in that direction. In the end, we are extremely happy with how this ruggedly handsome goblin (can goblins be ruggedly handsome?) turned out. As we moved from conceptualization to specific card art, we wanted to inject more humor into him. If we went with a simple, calm badass we wouldn’t be able to get as many laughs or give players a real character to act out. So a major part of Keet’s development went into figuring out how much of the time he really is as cool as he thinks he is, and when he isn’t. In the end, Keet turned out to be pretty energetic and emotive. His cards take you through the quiet and off-putting lows of a dedicated, meticulous researcher on up to the exhilarating highs of someone enthusiastically dedicated to his sharing his work. With a bit of sarcastic attitude mixed in, Keet came out with a great personality to fit with his exaggerated facial features and role in the party. Another thing that’s been popping up in the artwork of our more recent characters has been the cameo. As the number of adventurers that make up the guild known simply as “The Party” grew, it made more and more sense to show off how they interacted with one another. Part of our look and feel overview usually includes a little bit about who a new character hangs out with, which other characters are their friends, and who maybe rubs them the wrong way. Often enough, we come up with little histories for our characters along with the design process. Lizwick was an obvious compatriot for Keet, as both characters have a clear interest in strange and magical objects. We have a lot of Keet’s artwork uploaded to our Facebook Page. You can check it out in Keet’s Facebook Album. Keet’s artifacts needed to be a collection of amazing and useless objects. Some of them were easy to come up with, such as a helmet that may or may not be Dimli’s Great-Grandfather’s (how many great-grandfathers does this dwarf have? ), while others were a bit trickier. Fortunately, this deck, like many side-decks, was an excellent opportunity to inject more humor into the game. Like the rest of Keet’s art, you can check out some of these brilliant artifacts in Keet’s Facebook Album. That just about wraps it up for Keet! Look for him to come out next year as a brand new RDI: Allies product. If you are eager to try Keet before he hits store shelves in mid-to-late 2016, you can earn a copy for yourself through our SlugCrew Program. Run demos to teach RDI to new players at your local stores or game conventions and Keet can be yours!